Could a team lose the Commander in Chief’s Trophy and win that shiny trophy on the right in the same year? Yes, it could. But wagering on it might be a bad idea. 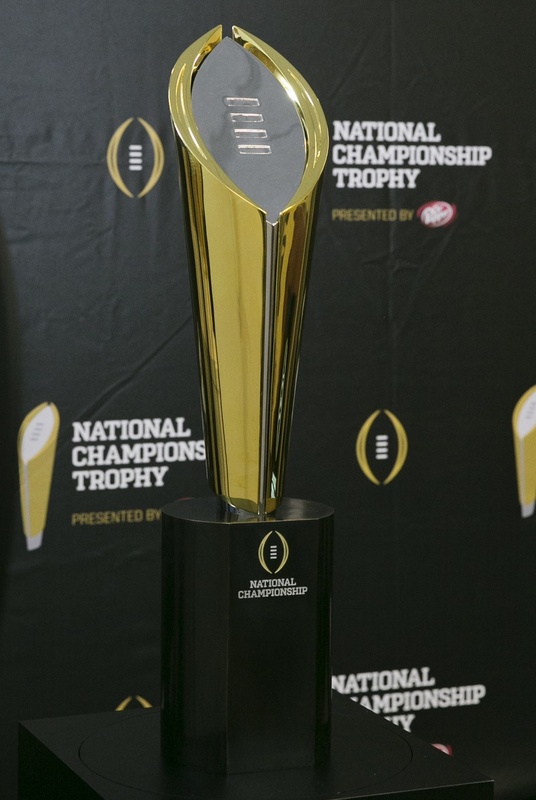 The College Football Playoff begins this season, with four teams from the NCAA’s top tier selected to face off in a single-elimination tournament to crown a champion. It’s a history-making innovation … unless you count the postseason for nearly every other team sporting event on the planet. Regardless, the group said Monday that it will make its semifinalist selections public on Dec. 7, live on ESPN before the start of that day’s NFL schedule. Media reports on the decision have played up the fact that some of the conference-title games — including the Mountain West Conference championship, which might feature Air Force if the preseason polls miss their mark — could end less than 12 hours before selection time. They neglect to mention the one top-tier game that won’t start until six days after selection time — Army faces Navy in Baltimore on Dec. 13. While Navy’s had a recent run of success that extends beyond its 12-game win streak over the Black Knights, and while Army hopes for a return to bowl consideration under a new head coach, neither program has been considered a threat to crack the playoff system. Based on scheduling, it would almost certainly take an unbeaten season for either squad to be in the mix, and even then it could be passed over for another unbeaten club or a one-loss team in a power conference. Army went 9-0 in 1996 before losing to Syracuse and still just barely cracked the national top-25 rankings. The Black Knights’ last unbeaten regular season came in 1958 (8-0-1); Navy’s last was 1926 (9-0-1), but the Mids would’ve been considered a playoff contender in 1963, when Roger Staubach led them to a 9-2 mark and a No. 2 national ranking at the end of the year. Still, both teams remain eligible for championship consideration — Gina Lehe, the senior director of communications and brand management for the College Football Playoff confirmed as much over email on Tuesday. So, how do you judge a team worthy of the national title bracket if it has yet to play the most important game of its season? “The committee will evaluate the teams based on their records as of selection Sunday (December 7 this year) and the final selections will be made that day,” Lehe wrote. In short, if a talented Army or Navy squad had a series of breaks go its way (how long of a series isn’t the issue), it could enter the rivalry game with a ticket to the College Football Playoff already punched. How that game would play out is anybody’s guess, but it’s very likely someone would write a book about it. Wishful thinking? Sure, but if fans aren’t allowed wishful thinking, ticket lines would be a whole lot shorter.